Christology In Context, the newest volume in Gabriel Fackre’s long-standing Christian Story, relates the classical teaching about Christ to present-day issues that preachers, teachers, and believers face — religious pluralism, evangelism, the place of angels, the problem of evil, and more. Drawing together reflections on Christology from throughout his life, Fackre moves from specific responses to church ministry and parishioners’ questions, through evangelical and ecumenical perspectives, to concluding chapters on Christ’s life, death, and resurrection. His Christology in Context solidly locates the incarnation and the atonement within the overarching biblical narrative in a way that will assist those who tell the story of Christ, whether from pulpit, study, or sidewalk. - Publisher This newest volume in Gabriel Fackre's "Christian Story" places the classical teaching about Christ in touch with the issues that pastors face in their preaching and teaching: religious pluralism, evangelism, the place of angels, the problem of evil, and more. 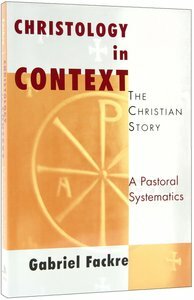 About "Christology in Context (#04 in Christian Story Series)"
This newest volume in Gabriel Fackre's "Christian Story" places the classical teaching about Christ in touch with the issues that pastors face in their preaching and teaching: religious pluralism, evangelism, the place of angels, the problem of evil, and more.